Sally Ride, as seen on the cover of author Lynn Sherr's new book about her life, "Sally Ride: America's First Woman in Space." Lynn Sherr knew Sally Ride. As a veteran journalist for ABC News, Sherr had helped to introduce Sally Ride to the world as the teen tennis player-turned-physicist who in 1978 was selected among NASA's first female astronauts. Sherr then covered Ride becoming the first American woman to fly in space six years later. Along the way, the two became friends. Sherr was not alone. Sally K. Ride, one of history's most famous astronauts, had kept her personal life secret, even from many of her friends. 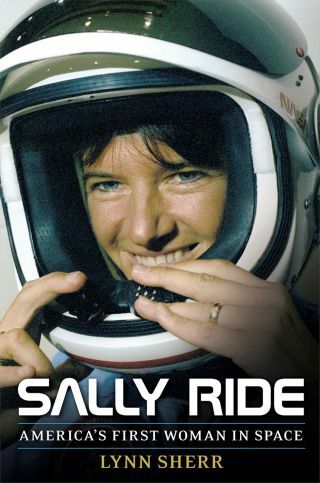 But within days of her passing, O'Shaughnessy and Ride's family members decided it was time to share more about the Sally Ride they knew and loved. The job fell to Sherr once again to introduce Ride to the world. In "Sally Ride: America's First Woman in Space," released Tuesday (June 3) by Simon & Schuster, Sherr reveals the woman behind the trailblazing astronaut. Sally Ride, America's first woman in space, looks out the forward windows of the space shuttle Challenger in June 1983.
collectSPACE.com: The book is titled simply, "Sally Ride: America's First Woman in Space," but in the book you mention that if Ride had to put a subtitle to her name – at least at one point in her life – it would have been physicist. Do you think that was true throughout the extent of her life? Sherr: I think there probably may have been a couple of weeks in her teen years when, if you woke her up in the middle of the night, she might have said tennis player. I think during the NASA years, she might have said astronaut. But overall, overarching, it was physicist. It was scientist. This was what she really cared about and that is why she went back to the life she went back to [after NASA]. When she left NASA — and I had no premonition of this, she did not pre-warn me or pre-tell me this — my reaction was right, this is a woman who really liked being in the stacks — if you're old enough to remember being in library stacks. This is a woman who liked curling up with a book or research or with a stack of books and figuring out the solution to something. I think [being a] scientist is what definitely made her tick. That is the overall piece of her and that is why I think she was exactly the person for the job [of the first American woman in space]. She was this extraordinary combination of the team tennis player, of the bold adventurous, love-to-fly, love-to-pilot astronaut, and of the scientist who wanted to figure things out. Plus she was funny. She just was the perfect choice as far as I could tell. collectSPACE.com: You write about the social history that changed as part of Sally Ride's life, and that plays a role in telling her story. Is it possible to tell Ride's story without delving into women's rights, the space race, and gay rights, or is that as much a part of her story as the details of her personal life? Sherr: I don't think you can tell the story of her life without telling those details. I am sorry that gay rights, the LGBT movement, was not further along earlier so that she might have benefited from being able to be more open than she ever felt she could be. But, surely the fact that the movement was not there, that our society was not further along, is very much part of her story because it certainly affected how she lived her personal life. In terms of the women's movement, there is absolutely no question that it's a critical part of Sally's life. If the women's movement hadn't come along and did what it did, by the time that Sally got to Stanford [University] and opened the newspaper that morning in January 1977, the article stating NASA was recruiting women would not have been there. And she knew that perfectly well. The other thing that is very much part of her story in terms of social movements and history is Sputnik. The very fact the Cold War was raging, that the Russians got a satellite up there first and launched us into a race to the moon very much affected her life. Because that was when the United States said that we have got to put a lot more of a push on science. I think the critical part of this to Sally's life, and I say this in the book, is that she was the lucky benefactor of all of these things coming together, but she was smart enough and quick enough and agile enough to seize the moment and turn them to her own use, which is what made history. Continue reading at collectSPACE.com to learn what surprised Lynn Sherr the most about Sally Ride’s secret life and what she feels is the astronaut's greatest legacy.